In <?xml:namespace prefix = st1 ns = "urn:schemas-microsoft-com:office:smarttags" />Oman we introduced Sarah to all our favorite Middle Eastern foods. She liked it so much that we are popularizing the phrase: “like a Sarah to Middle Eastern food” (as in: “Mozart took to the harpsichord like a Sarah to Middle Eastern food.”). Since then it has been dangerous to stand between Sarah and the most direct path to a Lebanese restaurant. Every year the cruising community reports one or two piracy attacks in the Gulf of Aden. Because most of these attacks occur in a 70 mile corridor between Yemen and Somalia, it is possible to minimize risk by traveling in a convoy with other cruisers and running without lights at night. As far as we can understand, most piracy is from people smugglers running boatloads of refugees out of Somalia. 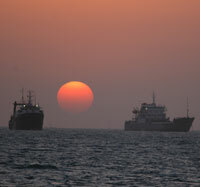 We had an uneventful 6 day passage from Oman to Aden, Yemen. It only took a couple hours to figure out that Yemen rocks. 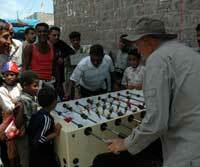 Aden is one of the friendliest places I’ve ever been. People stopped us as we walked down the street to shake our hands and welcome us to their country. They always get excited when they discover dad speaks Arabic. 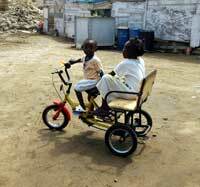 Filming is a challenge in this region of the world, especially without official permits. We try to be sensitive to the people who don’t want to be on camera while still getting enough shots to give an overview of each destination. In my experience most people are very happy to get their picture taken, especially if you show them the footage through the eyepiece. 1. It is never a good idea to film the guy with the AK-47 standing guard at the gate of the king’s palace no matter how much he looks like Ricky Martin. 2. Don’t take a picture of the giant sign saying “No Photos”…it kills your best alibi. 3. When the bedouin prince screams and runs in your direction with his wickedly-sharp knife as you try to interview one of his wives, point the camera at the camel. 4. If there is no camel, point it at the goat. 5. If there is no goat, point it at the Ricky Martin guy guarding the gate. 6, NO! Bad idea! Uh, just point it at that “No Photos” sign over there. 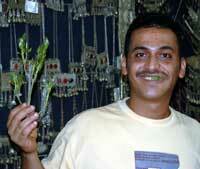 Each afternoon the streets of Aden are lined with men sitting on the ground and chewing green leaves called “gat”. After a few hours of chewing, gat numbs their mind and gives them a mild high. In the meantime they look like lazy chipmunks. On our last day dad and I filmed in the downtown market, which started a mini-riot of people who thought we were from the Arabic channel “Al-Jazeera”. The police broke up the crowd and told us to stop our subversive filming of the guy sewing dad’s shoe. The morning of our intended departure from Aden, news came in of a pirate attack on yachties in the stretch of water between Yemen and Somalia…two yachts had been attacked by armed men 30 miles off the coast. Shots were fired into the cruising yachts, one of which had a shotgun, so they shot back (which was probably more than the pirates bargained for). The pirates were in two small boats, so they split up and one of them made the fatal mistake of blocking the way of the non-shooting yacht, which rammed and nearly sunk them. The other pirate boat got disabled by the shotgun. The cruisers were not certain, but it is likely that a couple pirates did not survive the encounter. Both cruising yachts involved escaped relatively unscathed, except for bullet holes in their boats (fortunately above the waterline) and scrapes on the bow of the ramming boat. As you can imagine, the attack got the attention of the entire cruising community. Opinions are still flying, usually ending at the age old cruising dilemma of whether or not to carry weapons on board. Anyways, back to the adventure…. From Aden the next hurdle is the Bab El Mandeb (which means “Gate of Sorrow”), the narrow opening between Africa and the Arabian Peninsula at the bottom of the Red Sea. We called this passage “running the bob”. Winds, currents, and seas in that area are known to get nastily high, so the goal was to get through as quick as possible. We made it without too much difficulty through the Bab, but by the time we were officially in the Red Sea the wind was pushing 40 knots. 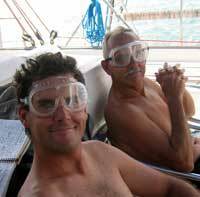 We anchored off the coast of Eritrea for our first authentic African sand storm…black sand everywhere! The Red Sea is a narrow sea that runs roughly northwest to southeast for 1500 miles. The coast of Saudi Arabia is basically off-limits to cruisers so most people hop up the coast of Eritrea, Sudan, and Egypt. Weather is the real challenge. The prevailing wind is from the north, meaning you either beat into the wind as you head north, or you wait for calms and motor. 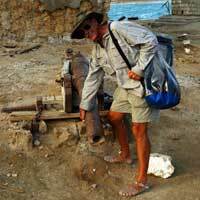 Eritrea is listed in the Lonely Planet guidebook as the second poorest country in the world. For decades they fought over disputed land with Ethiopia. 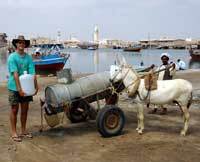 Massawa, the Eritrean port we entered, used to belong to Ethiopia. In the early 90’s, Ethiopia realized they were going to lose the port to their enemy, so they bombed it. Today, shells of buildings and sunken ships bear witness to the stupidity of war. This part of Africa was colonized by the Italians. Their influence is reflected in the architecture and advertisements. A lot of people immediately assumed we were Italian because we were white. 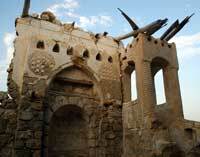 Massawa doesn’t have a lot to offer the average first world tourist. We successfully replenished our stocks of flour and cheese but searched in vain for ice cream. 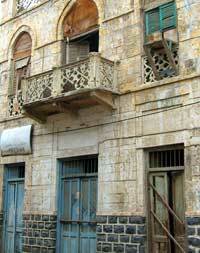 We weren’t overly enthralled with Massawa so we didn’t expect too much from Asmara, Eritrea’s capital city. The beautiful 3-4 hour minivan drive up into the lush mountains changed our minds. 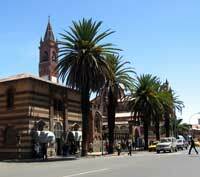 Asmara is a world apart from anything else we’d seen of Eritrea. The city has oven-baked pizza, clean streets, a cathedral, internet, an American embassy, and cool mountain air. 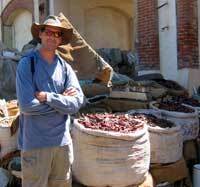 One of the most unusual things we saw in Asmara was the second hand metal suq. Because metal is in such sort supply here, workers use hammers to pound 55 gallon oil drums into flat sheets, which they then use to create all sorts of products. Old tins and metal rods are transformed into stylish soup ladles, while flat metal sheets become giant crosses for the peak of your roof. At the far end of the metal suq is a long row of chili pepper vendors. The pretty piles of red and green peppers (say that five times in a row really fast) look innocent and picturesque, but that is just nature’s idea of a practical joke. It is obvious from the lung-choking chili dust in the air that each of those cute little peppers is a nuclear powered nachos flame thrower. Sometime during the next two days, mom and Sarah sustained a couple mosquito bites that developed into full-blown dengue fever. We didn’t even know they were sick when we left Massawa, but once the fever started, they were down for the count. High fevers and extreme fatigue dogged them for the next two weeks. One notable stop we made was at an island called Difnein. We were traveling in company with three other boats, two of which who also had dengue on board. Although everyone else was tired, dad and I were good to go, so we went ashore and filmed. We spent a good deal of time filming a giant osprey (big bird of prey) nest on a plateau before we tromped over to muddy flats to film flat-billed birds. I walked out a bit farther than I should and got sucked up to my knees instantly. It was a bit worrisome because we didn’t know how deep the mud was, so Dad, being the consummate filmmaker and documentarian that he is, laughed and took pictures for the ten minutes it took me to travel two feet back to hard ground again. That evening another boat informed us that Difnein Island is partially covered by land mines. The map in the new version of the cruising guide (which we didn’t have, but soon borrowed) marked out a large minefield between the beach and the osprey nest, much of which we wandered through earlier that day. It was a sobering revelation. So, thanking God for our safety and shaking our heads at the absolute stupidity of the existence of land mines in general, we made our way to Sudan. Sudan is an extremely security-conscious country, so we didn’t take the video camera into public. 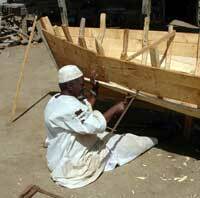 The anchorage in Suwakin is located next to the ruins of one of the last slave trading centers in the world. Tourism is scarce, but the antiquities department has started a renovation and is trying to get the ruins listed as a world heritage site. 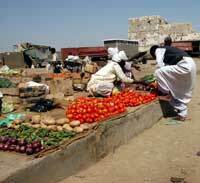 The new city of Suwakin is bustling marketplace filled with donkey carts, goats, and firewood-laden camels. A market supplies excellent fruits and vegetables, but once again, ice cream is nonexistent (I realize it seems like I’m obsessing about ice cream, but almost all the conversations we have when we’re sailing through hot, dusty weather eventually revolve around it). Every day we bought fresh bread from the bakery. Mmmmm. After a week in Suwakin, Sarah and mom were both feeling well enough to do some cooking. Thus ended the David Culinary Experiment of 2005. It was fun, but it is good to have the big hitters back (and Mom says that lobster thermadore has nothing to do with a thermos and don’t I know how expensive thermoses are and that if I ever try to stuff a lobster in one again she’ll get really mad). 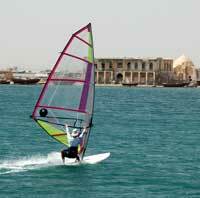 We stayed a little longer in Suwakin than we expected, so I pulled out the windsurfer for the first time in months. In a frenzy of machismo, I rigged up our biggest sail in spite of the high winds (we have three windsurfing sails on board…for low winds, use a bigger sail for more power…for high winds use smaller sail so you don’t die, etc.). This turned out to be one of those object lessons in life, like when your parents tell you not to lick frozen lampposts. I think my arms stretched a couple of inches from hanging on to the sail that day. definition monitor you probably can't see them. Plus, the picture is a little blurry. Suwakin market. No ice cream. Will it fit on the boat? seconds after this picture was taken. This was a great day for windsurfing in Suwakin. are having their engines overheat from accidental jellyfish suckeage into their cooling systems). 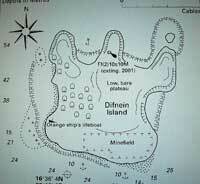 A map of land mines on Difnein Island. Much more useful to have BEFORE you go ashore. but it's the only surviving evidence that I cooked. 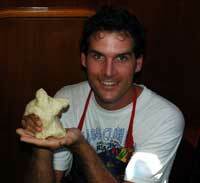 It's a sugar cookie dough man, by the way.